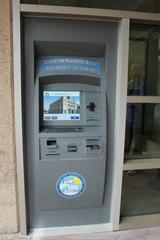 SANTA ANA, CA (June 3, 2013) - The City of Santa Ana is pleased to announce that it has installed its first bill payment kiosk at City Hall. The kiosk will make it easier for residents to submit payments for utility bills, parking citations, dog licenses, paramedic subscriptions and business licenses. This state of the art kiosk accepts checks, credit cards and cash, and also dispenses change in currency and coins for cash transactions. The City has a large number of customers who come to City Hall to make their municipal payments; therefore, an alternative payment method became necessary to accommodate recent city hall closures and to alleviate the need to wait in line.